Mango Indica Tea is a fine scented tea based on a blend of loose leaf teas from Ceylon and China. We scent the tea with mango and add Marigold petals and chunks of dried pineapple. 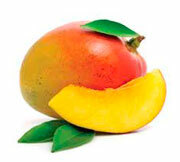 Mango Indica is a real fruity tea with a fine tropical aroma. Brewing instructions: Brew using boiling water and leave to infuse for 3 – 4 minutes.